The competitiveness of the telecommunications sector is an important determinant of market development. But measures to reflect this are often lacking or simplistic. For example, a proxy is often employed with a value of 3 assigned if a country has full competition, 2 if it has “partial” competition, 1 if it has a duopoly (two operators) and 0 if there is a monopoly. This type of measure not only lacks granularity (a more precise reflection of how intense competition is in markets where it exists) but also raises questions such as the definition of “partial” competition and the difference with a duopoly. Another method used is based on the number of operators under the assumption that the more there are, the better. This has limitations since some countries issue regional licenses for telecommunications resulting in a relatively large number of operators but not necessarily more competition. A market organized on regional lines with 3 regions and two operators per region would have 6 operators. It is a less competitive market than a country with 3 operators with nationwide licenses. The HHI has been calculated for 40 major economies for the year 2004. 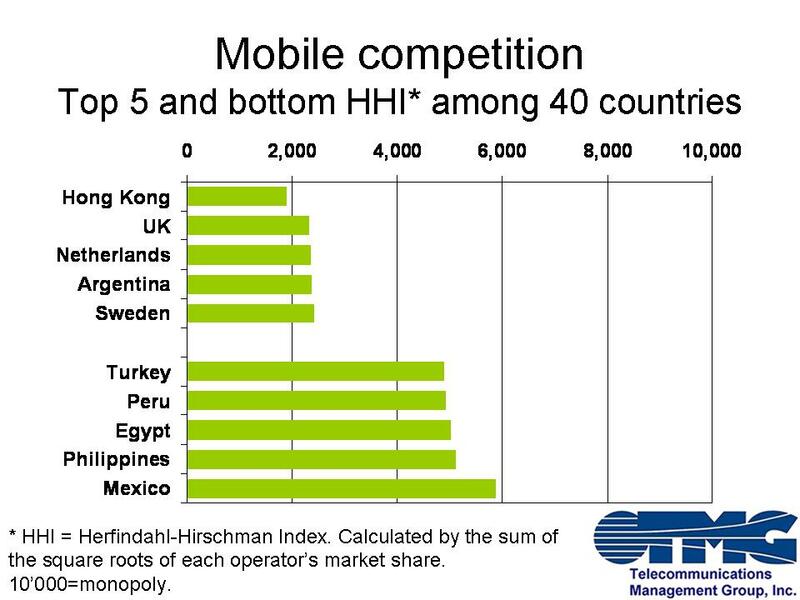 The most competitive mobile market is Hong Kong with an HHI of 1,897. The least competitive is Mexico with an HHI of 5,873 . The impact of competition is noticable. Hong Kong has the most affordable pre-paid prices in the world at US$3.35 per month. 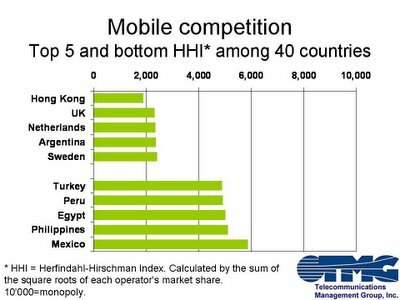 Mexico has an HHI some three times higher than Hong Kong; mobile prices in Mexico are also some three times higher than in Hong Kong.